I don't eat meat, even to the point of avoiding meat byproducts like broth and gelatin and, well, it pays to read labels. "The Original & Genuine Lea & Perrins Worcestershire Sauce" contains anchovies, as an example. But I'm not a fanatic. In the words of my wife, I often eat "pre-chicken." I love "the incredible edible egg," and I especially like them boiled, halved, and sprinkled with "Tabasco" sauce (no anchovies included). And that brings me to the observation that long ago I learned a good measure of salt in the boiling water transforms the egg shells to the easily peel'able stage. There are other methods, but the salt-in-the-water method works for me, and it has the advantage of being simple. I suspect the salt causes the albumen (the egg's thin outer membrane) to bind to the shell. But sometimes it simply doesn't work. Or better said, it works on all but one or two or three of the eggs in the pot. I suspect it has something to do with the genetic engineering so prevalent in the chicken industry. I suspect that layer chickens have been engineered to produce shells that are of a thickness that is both sturdy enough to ship and easy enough to crack. Which is probably one more reason why the vegan lifestyle appeals. Except that plants are being engineered too. 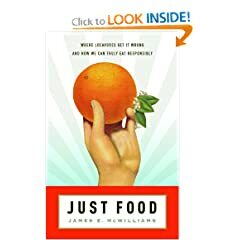 Amazon link for Just Food.